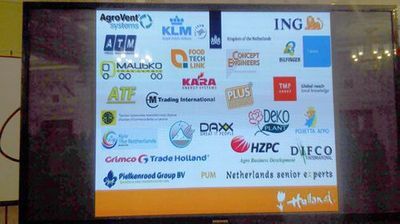 Over the last couple of years, the Netherlands has been establishing numerous business partnerships with Ukrainian companies. To explore the market opportunities and business potential of different regions of Ukraine, the Embassy of the Netherlands has organized a series of trade missions to a number of Ukrainian cities, including Lutsk, Lviv, Kharkiv and Dnipropetrovsk. The most recent Dutch Trade Mission titled ‘Doing Business with the Netherlands’ took place in Dnipropetrovsk on October 12–14, and Daxx was happy and honored to join the event along with 24 other companies headed by Kees Klompenhouwer, Ambassador of the Netherlands to Ukraine. Dnipropetrovsk was picked as a location for the Dutch Trade Mission for a few very substantial reasons. It is the fastest growing region in Ukraine and one of the major centers of mining and finance, engineering and IT. About 10% of all Ukraine’s IT talent is based in Dnipropetrovsk, as well as one of our offices. 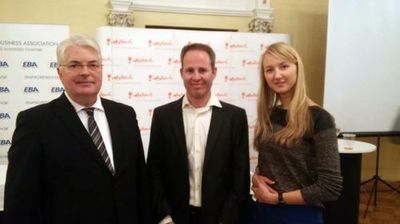 At the photo: Kees Klompenhouwer, Ambassador of the Netherlands to Ukraine; Noud Bongers, Business Support Manager at Daxx; Svetlana Trofymenko, Marketing Expert at Daxx. 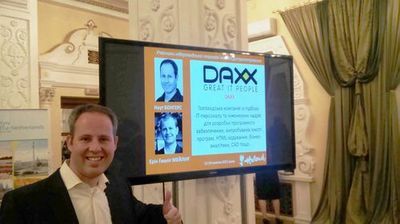 Noud Bongers, Business Support Manager at Daxx, says that the IT industry is developing as actively as never before in both Ukraine and the Netherlands. The latter is already well known as one of the world’s most innovative countries, with Amsterdam aiming to become a top European startup hub, and Ukraine is catching up very quickly. This may be due to the fact that the Dutch and Ukrainians, according to Kees Klompenhouwer, both share a pragmatic nature and are very good engineers. “They are interested in hiring developers in Ukraine as this way they can reduce their IT-related expenses. However, the main reason is still the opportunity to work with talented tech workforce we can provide. The main message of the Dutch Trade Mission to Dnipropetrovsk was clear: Ukraine is an innovative and vibrant country ready for doing business with the Netherlands and other European countries. We would like to thank the Embassy of the Netherlands to Ukraine and Ambassador Kees Klompenhouwer for giving us a fantastic opportunity to discuss Ukraine’s economic relations with the Netherlands and establish new business partnerships. 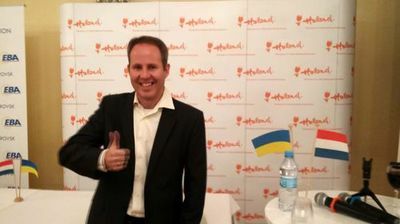 We were deeply impressed by the calibre of entrepreneurs who also attended the Dutch Trade Mission to Dnipropetrovsk. Their experience. as well as ours, is an obvious proof of the effectiveness and reliability of business cooperation between Ukraine and other European countries. And if you still don’t think that investing in Ukraine is a great move, this video will definitely convince you.